When Triumph decided to create a model that sat between the Thruxton and the Bonneville T120, the designers could have simply taken the Thruxton, adjusted the riding position through higher bars and lower pegs from the T120, and then called it a day. 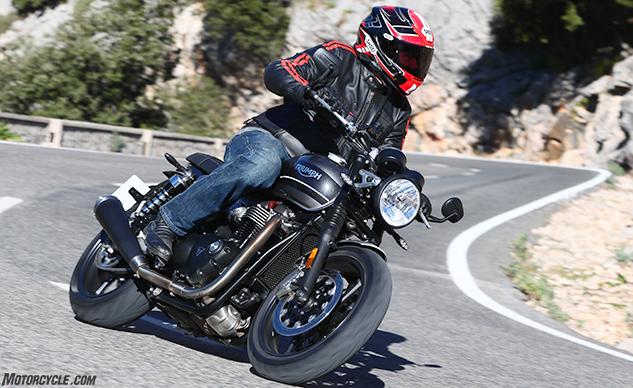 Instead, the engineers cranked out an all-new model, taking features of both the Thruxton and the T120 and turned it into the 2019 Triumph Speed Twin. We’ve already posted the first ride review of the Speed Twin, but in these connected days, we also need to post a review made up of moving images. So, behold! Through the marvels of modern technology, you can enjoy the company of me, your humble reviewer, wherever you have an internet-connected device. What can you expect in this video – beyond my dazzling good looks? Well, I try to give you all the information you need in just over six minutes. You’ll learn about what has changed in the engine to allow for the loss of 5.5 lb. Or how about the chassis itself, where the wheels are responsible for about 10 lb. of the reduction plus the change in the associated rotating mass? As much as we enjoy bringing you these videos, we here at MO hope you’ll still take the time to read the full article where I have the luxury of consulting the press kit for specifications rather than relying on my own questionable memory. So, what are you waiting for? Watch the video and then (re)read the review!